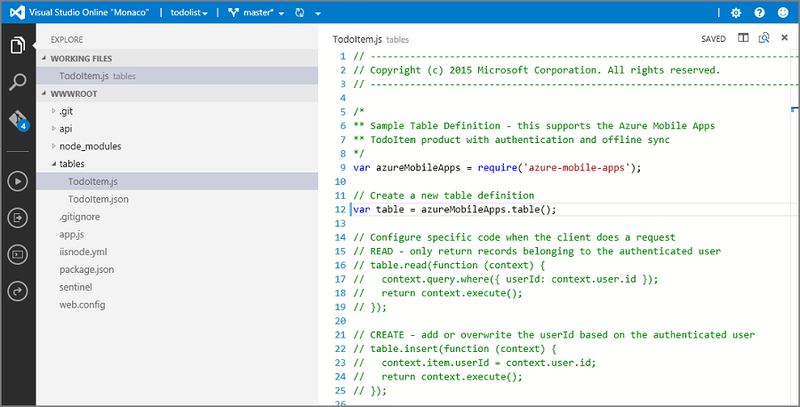 This article provides detailed information and examples that show how to work with a Node.js back end in the Mobile Apps feature of Azure App Service. Both operations provide for authentication across all identity providers that Azure App Service allows. These providers include social identity providers such as Facebook, Twitter, Google, and Microsoft, as well as Azure Active Directory for enterprise identity. You can find samples for each use case in the samples directory on GitHub. The Mobile Apps Node.js SDK supports the current LTS release of Node and later. Currently, the latest LTS version is Node v4.5.0. Other versions of Node might work but are not supported. The node-mssql driver supports Azure SQL Database and local SQL Server instances. The sqlite3 driver supports SQLite databases on a single instance only. // Define a TodoItem table. // Add the Mobile API so it is accessible as a Web API. // Start listening on HTTP. You can find the code for this basic application in the basicapp sample on GitHub. Open the New Project dialog box (from File > New > Project). Select Basic Azure Node.js Express 4 Application. Fill in the project name. Select OK.
Right-click the npm node and select Install New npm packages. You might need to refresh the npm catalog after you create your first Node.js application. Select Refresh if necessary. Enter azure-mobile-apps in the search box. Select the azure-mobile-apps 2.0.0 package, and then select Install Package. Either run the application locally (the API is served on http://localhost:3000) or publish to Azure. You can create a Mobile Apps back end right in the Azure portal. You can either complete the following steps or create a client and server together by following the Create a mobile app tutorial. The tutorial contains a simplified version of these instructions and is best for proof-of-concept projects. Back in the Get started pane, under Create a table API, choose Node.js as your back-end language. Select the box for I acknowledge that this will overwrite all site contents, and then select Create TodoItem table. When you create a Node.js Mobile Apps back end by using the portal's Quick start pane, a Node.js project is created for you and deployed to your site. In the portal, you can add tables and APIs, and edit code files for the Node.js back end. You can also use various deployment tools to download the back-end project so that you can add or modify tables and APIs, and then republish the project. For more information, see the Azure App Service deployment guide. Install Git, if you haven't already done so. The steps required to install Git vary between operating systems. For operating system-specific distributions and installation guidance, see Installing Git. See Prepare your repository to enable the Git repository for your back-end site. Make a note of the deployment username and password. In the pane for your Mobile Apps back end, make a note of the Git clone URL setting. Browse to the local directory (/todolist in the preceding example), and notice that project files have been downloaded. Locate the todoitem.json file in the /tables directory. This file defines permissions on the table. Also find the todoitem.js file in the same directory. It defines the CRUD operation scripts for the table. $ git commit -m "updated the table script"
When you add new files to the project, you first need to run the git add . command. The site is republished every time a new set of commits is pushed to the site. Microsoft Azure provides many mechanisms for publishing your Mobile Apps Node.js back end to the Azure service. These mechanisms include deployment tools integrated into Visual Studio, command-line tools, and continuous deployment options based on source control. For more information, see the Azure App Service deployment guide. If you only want this option available when developing locally, you can add this setting to your azureMobile.js file. GET /tables/tablename Get all records in the table. GET /tables/tablename/:id Get a specific record in the table. POST /tables/tablename Create a record in the table. PATCH /tables/tablename/:id Update a record in the table. DELETE /tables/tablename/:id Delete a record in the table. This Web API supports OData and extends the table schema to support offline data sync. // Define the database schema that is exposed. // Provide initialization of any tables that are statically defined. // Additional configuration for the table goes here. Tables use a dynamic schema by default. To turn off the dynamic schema globally, set the MS_DynamicSchema app setting to false in the Azure portal. You can find a complete example in the todo sample on GitHub. You can explicitly define the columns to expose via the Web API. The azure-mobile-apps Node.js SDK automatically adds any extra columns required for offline data sync to the list that you provide. For example, the quickstart client applications require a table with two columns: text (a string) and complete (a Boolean). // Define the columns within the table. // Turn off the dynamic schema. If you define tables statically, you must also call the tables.initialize() method to create the database schema on startup. The tables.initialize() method returns a promise so that the web service does not serve requests before the database is initialized. Use the memory driver to provide a non-persistent example store. Use the mssql driver to provide a SQL Server Express data store for development. Use the mssql driver to provide an Azure SQL Database data store for production. The Mobile Apps Node.js SDK uses the mssql Node.js package to establish and use a connection to both SQL Server Express and SQL Database. This package requires that you enable TCP connections on your SQL Server Express instance. The memory driver does not provide a complete set of facilities for testing. If you want to test your back end locally, we recommend the use of a SQL Server Express data store and the mssql driver. Download and install Microsoft SQL Server 2014 Express. Ensure that you install the SQL Server 2014 Express with Tools edition. Unless you explicitly require 64-bit support, the 32-bit version consumes less memory when running. a. Expand the SQL Server Network Configuration node in the tree menu. b. Select Protocols for SQLEXPRESS. c. Right-click TCP/IP and select Enable. Select OK in the pop-up dialog box. d. Right-click TCP/IP and select Properties. e. Select the IP Addresses tab. f. Find the IPAll node. In the TCP Port field, enter 1433.
g. Select OK. Select OK in the pop-up dialog box. h. Select SQL Server Services in the tree menu. i. Right-click SQL Server (SQLEXPRESS) and select Restart. j. Close SQL Server 2014 Configuration Manager. Right-click your instance in Object Explorer and select Properties. Ensure that SQL Server and Windows Authentication mode is selected. Expand Security > Logins in Object Explorer. Enter a login name. Select SQL Server authentication. Enter a password, and then enter the same password in Confirm password. The password must meet Windows complexity requirements. Right-click your new login and select Properties. Select the check box for the dbcreator server role. Close SQL Server 2015 Management Studio. Be sure to record the username and password that you selected. You might need to assign additional server roles or permissions, depending on your database requirements. $env:SQLCONNSTR_MS_TableConnectionString = "Server=127.0.0.1; Database=mytestdatabase; User Id=azuremobile; Password=T3stPa55word;"
Access the database through a TCP/IP connection. Provide a username and password for the connection. We recommend that you add azureMobile.js to your .gitignore file (or other source code control ignore file) to prevent passwords from being stored in the cloud. Always configure production settings in App settings within the Azure portal. Select All resources or App Services, and then select the name of your mobile app. The Settings pane opens by default. If it doesn't, select Settings. On the GENERAL menu, select Application settings. Scroll to the App settings section. If your app setting already exists, select the value of the app setting to edit the value. If your app setting does not exist, enter the app setting in the Key box and the value in the Value box. Changing most app settings requires a service restart. In the upper left of the window, select the +NEW button > Web + Mobile > Mobile App, and then provide a name for your Mobile Apps back end. In the Resource Group box, enter the same name as your app. a. Select App Service Plan > +Create New. b. Provide a name of the new App Service plan and select an appropriate location. c. Select an appropriate pricing tier for the service. Select View all to view more pricing options, such as Free and Shared. d. Click the Select button. e. Back in the App Service plan pane, select OK.
Provisioning a Mobile Apps back end can take a couple of minutes. After the Mobile Apps back end is provisioned, the portal opens the Settings pane for the Mobile Apps back end. You can choose to either connect an existing SQL database to your Mobile Apps back end or create a new SQL database. In this section, we create a SQL database. If you already have a database in the same location as the Mobile Apps back end, you can instead select Use an existing database and then select that database. We don't recommend the use of a database in a different location because of higher latencies. In the new Mobile Apps back end, select Settings > Mobile App > Data > +Add. In the Add data connection pane, select SQL Database - Configure required settings > Create a new database. Enter the name of the new database in the Name box. Select Server. In the New server pane, enter a unique server name in the Server name box, and provide a suitable server admin login and password. Ensure that Allow azure services to access server is selected. Select OK. In the New database pane, select OK.
Back in the Add data connection pane, select Connection string, and enter the login and password that you provided when you created the database. If you use an existing database, provide the login credentials for that database. Select OK.
Back in the Add data connection pane again, select OK to create the database. Creation of the database can take a few minutes. Use the Notifications area to monitor the progress of the deployment. Do not progress until the database is deployed successfully. After the database is deployed, a connection string is created for the SQL Database instance in your Mobile Apps back-end app settings. You can see this app setting in Settings > Application settings > Connection strings. Each table has an access property that you can use to control access to the table. The following sample shows a statically defined table with authentication required. // Require authentication to access the table. anonymous indicates that the client application is allowed to read data without authentication. authenticated indicates that the client application must send a valid authentication token with the request. disabled indicates that this table is currently disabled. If the access property is undefined, unauthenticated access is allowed. You can set up various claims that are requested when authentication is set up. These claims are not normally available through the context.user object. However, you can retrieve them by using the context.user.getIdentity() method. The getIdentity() method returns a promise that resolves to an object. The object is keyed by the authentication method (facebook, google, twitter, microsoftaccount, or aad). // Create a new table definition. // Configure specific code when the client does a request. // READ: only return records that belong to the authenticated user. // CREATE: add or overwrite the userId based on the authenticated user. // UPDATE: only allow updating of records that belong to the authenticated user. // DELETE: only allow deletion of records that belong to the authenticated user. To see what claims are available, use a web browser to view the /.auth/me endpoint of your site. read is the RESTful GET operation on the table. insert is the RESTful POST operation on the table. update is the RESTful PATCH operation on the table. delete is the RESTful DELETE operation on the table. // Read-only table. Only allow READ operations. // Define a static schema for the table. // Require authentication for this table. // Ensure that only records for the authenticated user are retrieved. // When adding records, add or overwrite the userId with the authenticated user. // Turn on soft delete. You should establish a mechanism for deleting records: a client application, a WebJob, an Azure function, or a custom API. Seeding of data happens only when you've used the Mobile Apps SDK to create the table. If the table already exists in the database, no data is injected into the table. If the dynamic schema is turned on, the schema is inferred from the seeded data. We recommend that you explicitly call the tables.initialize() method to create the table when the service starts running. The swagger endpoint is located at http://yoursite.azurewebsites.net/swagger. You can access the Swagger UI via the /swagger/ui endpoint. If you choose to require authentication across your entire application, Swagger produces an error. For best results, choose to allow unauthenticated requests in the Azure App Service Authentication/Authorization settings, and then control authentication by using the table.access property. You can also add the Swagger option to your azureMobile.js file if you only want Swagger support for developing locally. Mobile Apps integrates with Azure Notification Hubs so you can send targeted push notifications to millions of devices across all major platforms. By using Notification Hubs, you can send push notifications to iOS, Android, and Windows devices. To learn more about all that you can do with Notification Hubs, see the Notification Hubs overview. // Create an APNS payload. // Send a push notification by using APNS. // Do something or log the error. // Send a notification to the current user. When you're registering for push notifications from an authenticated client, make sure that authentication is complete before you attempt registration. In addition to the Data Access API via the /tables endpoint, Mobile Apps can provide custom API coverage. Custom APIs are defined in a similar way to the table definitions and can access all the same facilities, including authentication. Use the import method to import the api directory. // Import the custom API. Each parameter is one of the standard RESTful verbs: GET, POST, PATCH, or DELETE. The method is a standard ExpressJS middleware function that sends the required output. // All methods must be authenticated. // The GET methods must be authenticated. The same token that is used for the tables endpoint must be used for custom APIs that require authentication. // Set up large body content handling. The file is base-64 encoded before transmission. This encoding increases the size of the actual upload (and the size that you must account for). // Check for parameters. If not there, pass on to a later API call. // driver can handle is allowed. // request.azureMobile. The data object contains the configured data provider. Node.js applications have access to a wide range of diagnostic log tools. Internally, the Mobile Apps Node.js SDK uses Winston for diagnostic logging. Logging is automatically enabled when you enable debug mode or set the MS_DebugMode app setting to true in the Azure portal. Generated logs appear in the diagnostic logs in the Azure portal. You can even edit table operations by using App Service Editor. When you select Easy tables in your back-end site settings, you can add, modify, or delete a table. You can also see data in the table. Change permissions: Modify the permission for read, insert, update, and delete operations on the table. Options are to allow anonymous access, to require authentication, or to disable all access to the operation. Edit script: The script file for the table is opened in App Service Editor. Manage schema: Add or delete columns, or change the table index. Clear table: Truncate an existing table by deleting all data rows but leaving the schema unchanged. Delete rows: Delete individual rows of data. View streaming logs: Connect to the streaming log service for your site. You can use Easy APIs to create and work with custom APIs right in the portal. You can edit API scripts by using App Service Editor. When you select Easy APIs in your back-end site settings, you can add, modify, or delete a custom API endpoint. In the portal, you can change the access permissions for an HTTP action, edit the API script file in App Service Editor, or view the streaming logs. In pane for your Mobile Apps back end, select All settings > either Easy tables or Easy APIs. Select a table or API, and then select Edit script. The script file opens in App Service Editor. Make your changes to the code file in the online editor. Changes are saved automatically as you type.